Tom completed his PhD at the Research Institute for Sport and Exercise Sciences, Liverpool John Moores University in 2014. 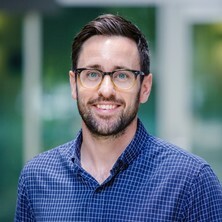 The research work within Tom’s PhD focused on cardiovascular and thermoregulatory (dys)function in females across the lifespan, and the potential role of exercise training in symptomatic post-menopausal females that suffer from hot flushes. He is experienced in leading exercise trials in at-risk patient groups, and recently completed a 3-year postdoctoral position at the University of the Sunshine Coast focussed on understanding the risks and benefits of exercise in patients with abdominal aortic aneurysm. Tom’s research interest is in cardiovascular physiology, healthy ageing and cardiovascular disease; focussing on the benefits of exercise training for the prevention and treatment of chronic disease. Tom also aims to understand changes in cardiovascular function and structure with age and chronic disease. In the lab, he uses a variety of novel imaging approaches for the assessment of blood flow, vascular function and structure, including at the brain, conduit and micro-vessels. He supervises PhD and masters candidates across institutions, and was recently successful in gaining a collaborative research grant assessing exercise and passive heating in patients with periperal arterial disease. Perissiou, M., Bailey, T. G., Windsor, M., Nam, M., Schulze, K., Greaves, K, Leicht, A., Golledge, J. and Askew, C. D. (2017). Effect of exercise intensity on the acute response of arterial stiffness in people with and without abdominal aortic aneurysm. In: 22nd Annual Meeting of the European College of Sport Science, Essen, Germany, (). 5-8 July 2017. Bailey, T. G., Perissiou, M., Windsor, M., Russell, F. D., Nam, M., Greaves, K., Golledge, J., Green, D. J. and Askew, C. D. (2017). The acute effects of exercise intensity on brachial artery endothelial function in abdominal aortic aneurysm patients. In: 22nd Annual Meeting of the European College of Sport Science, Essen, Germany., (). 5-8 July 2017.